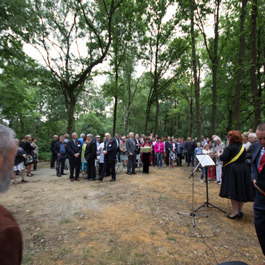 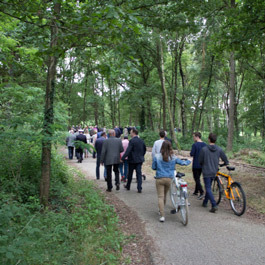 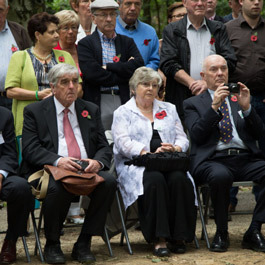 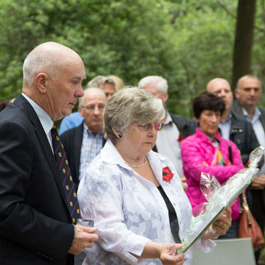 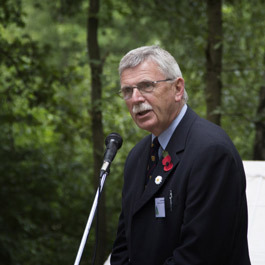 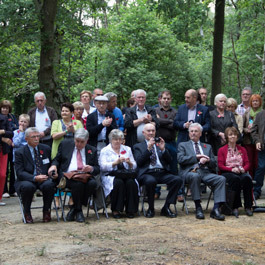 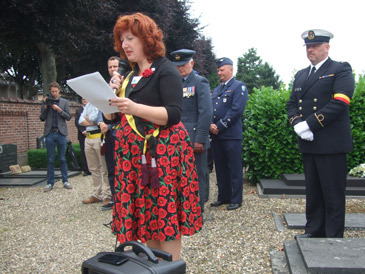 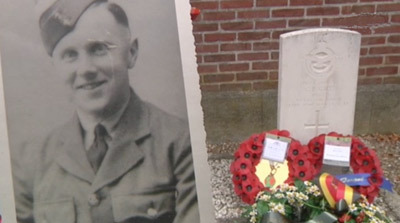 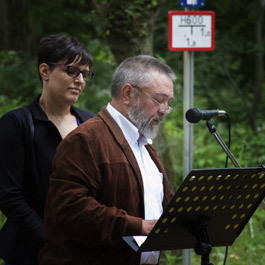 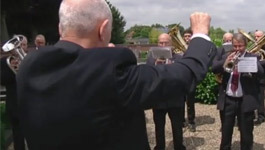 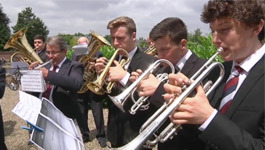 The Community of As (Asch) in Belgium welcomed representatives of the Gowertonian Society to a military ceremony at the graveside of Pilot Penry Guy and to the unveiling of a memorial at the place where parts of his aircraft were found in the forest near the station. 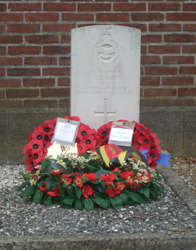 Pilot Officer Penry Guy maintained control of the aircraft, saving the six members of the crew but lost his life, 22 years old. 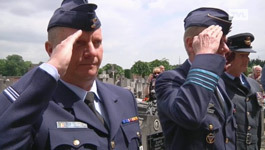 The Missing Man Formation salute, the flyover of aircraft, was performed by the Belgian Air Force in honour of the fallen pilot. 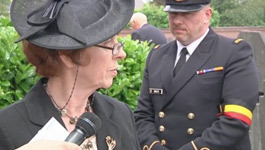 Kathleen De Cleene, Minister of Culture, As. 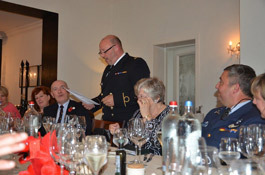 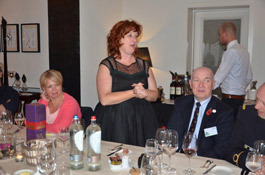 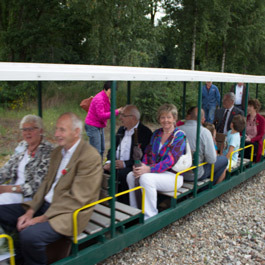 Following a reception at the Station Bar for all who attended the unveiling ceremony in the forest, a celebration dinner was held at Hotel Mardaga near the station, close to the place where parts of the Lancaster had been found by Jean-Pierre Wuyts. 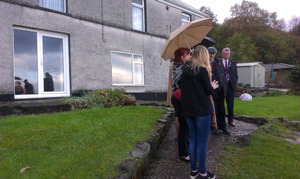 The representatives of the Gowertonian Society were warmly welcomed by The Mayor of As, Miel Craeghs, the Minister of Culture Kathleen De Cleene and their Deputies. 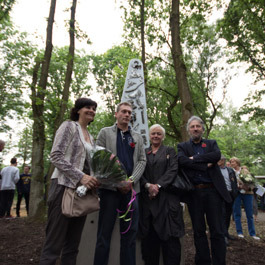 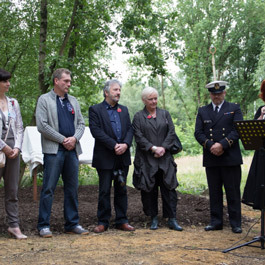 Artists and designer of the memorial, Julia and her husband Theo were present, Jean-Pierre Wuyts with his wife Connie and daughter Eva, godmother of the monument Suzanne Lemmerlijn, representatives of the Belgian Air Force and administration staff of the As Town Hall. 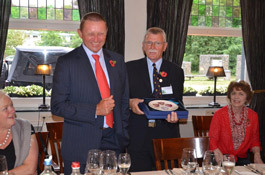 The Gowertonian Society Chairman, Dr Alun Jones, presented a Gowertonian Society Centenary Plate to the Mayor of As and a Gowertonian Society tie to Jean-Pierre Wuyts. 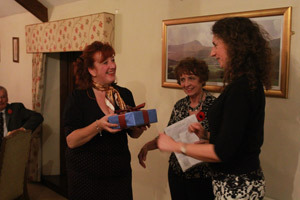 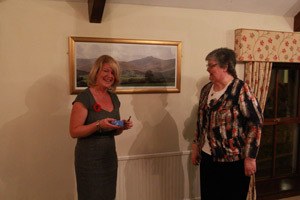 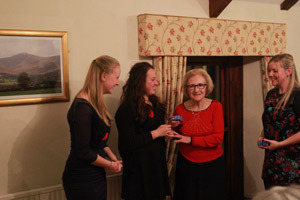 President, Val Richards presented Kathleen De Cleene with a Welsh Dragon soft toy. 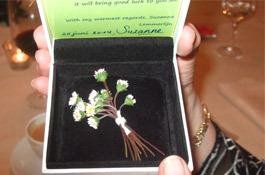 Suzanne Lemmerlijn, godmother of the monument, had made a beautiful posy of dried daisies for Gill, presented by Kathleen. 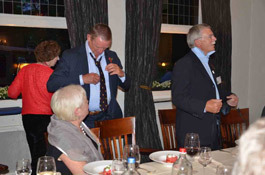 There was a ceremonial swapping of ties with our Belgian hosts. 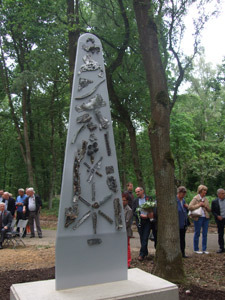 Pieces of a Lancaster Bomber were found, using a metal detector, in the forest near the station in As (formerly Asch), Belgium by Jean-Pierre Wuyts, a resident of the town. 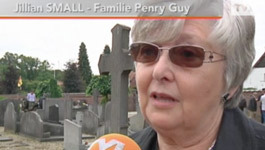 J-P went to the local cemetery where he found the grave of pilot, Penry Guy. 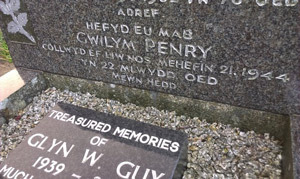 By typing the words 'Lancaster' and 'Penry Guy' into the search engine of his computer, the Gowertonian Society website address appeared on his screen. 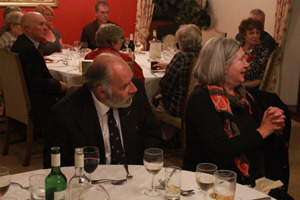 Jean-Pierre, keen to find out more, then contacted the GS website. 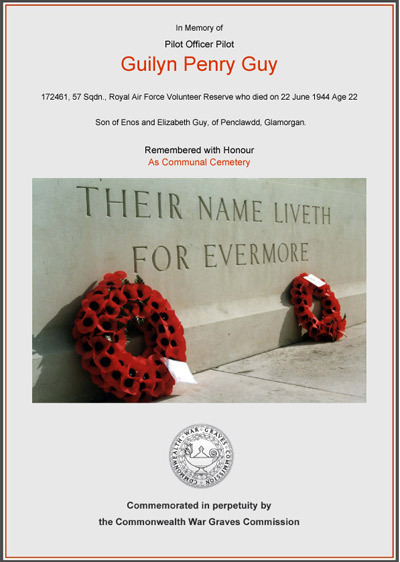 Pilot Officer, Bomber Command, R.A.F. 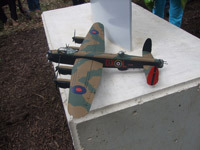 The Lancaster bomber, of which he was pilot, was hit while over Belgium, June 21/22, 1944. 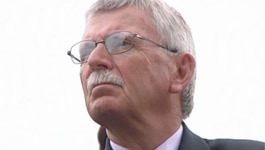 He held it in control for his six comrades to escape, and so lost his own life. 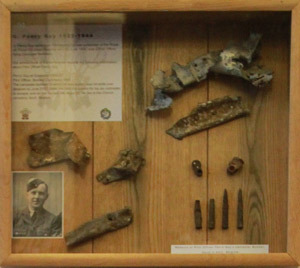 Aged 22 years. 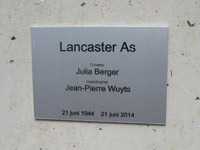 He lies in the Parish Church Cemetery, Asch, Belgium. 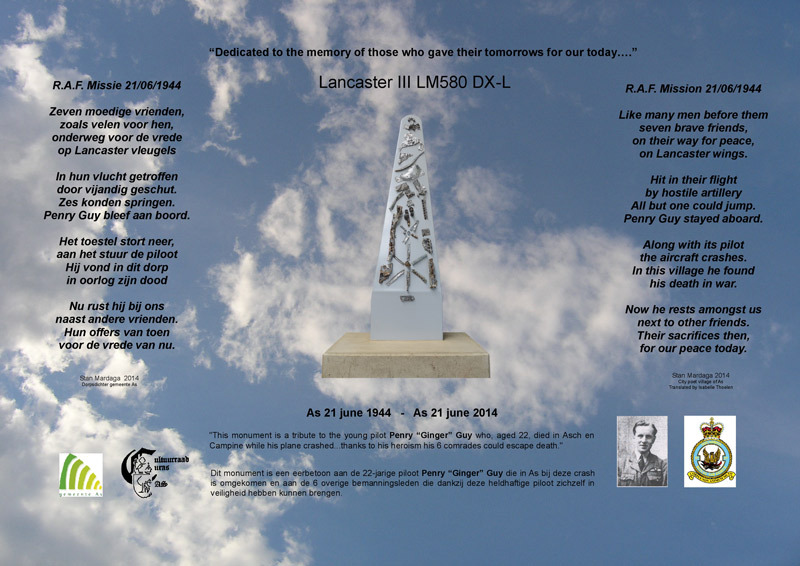 An appeal was made to visitors to our website and to members of our website forum for more details of the tragic last flight of the Lancaster Bomber. 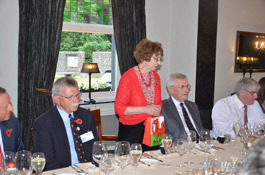 Gowertonian, Alan Boulton, who has for many years lived in Canada, was able to help J-P with his research. 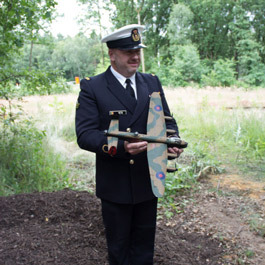 Alan has a friend called Ray Sherk, a spitfire pilot in World War 2 who was captured by the Germans but managed to escape. 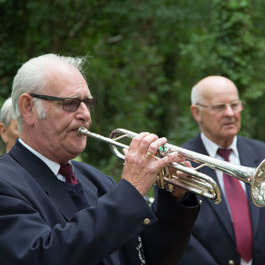 Ray, 93 years old, still flies his own plane - and he also surfs the internet! 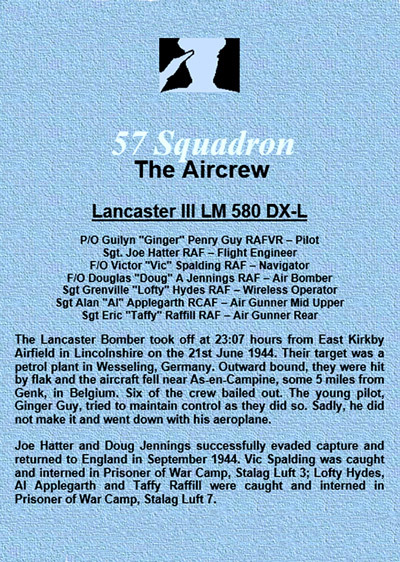 He e-mailed many files of information he found on the Internet to Jean-Pierre via the Gowertonian Society website, including a Death Certificate and details of the Aircrew of Lancaster 111 LM 580 DX-L and Pilot Officer Penry Guy. 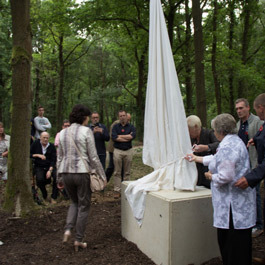 Armed with this information, Jean-Pierre convinced the As Town Council to honour Pilot Officer Penry Guy with a military ceremony at the cemetery in As and also the unveiling of a monument in the forest near the site where the pieces of the Lancaster were found. 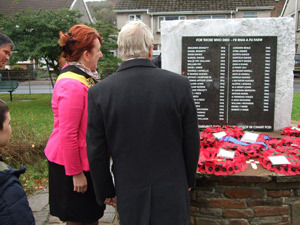 A magnificent tribute was planned for Welshman and Gowertonian, Pilot Officer Penry Guy and details of the programme were sent to the GS website by the Minister of Culture, Kathleen De Cleene. 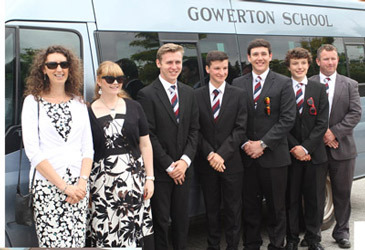 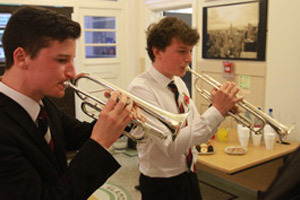 Many thanks to Kath Lawlor, music teacher at Gowerton School, for supporting the Gowertonian Society by bringing music students to play at the Military Ceremony, especially at one of the busiest times in the school calendar. 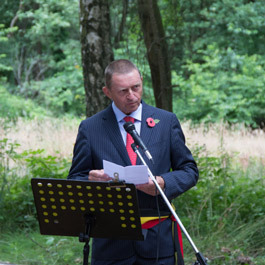 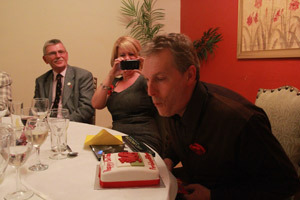 Unfortunately, the one remaining survivor, Douglas Jennings, was not well enough to attend but sent his best wishes. 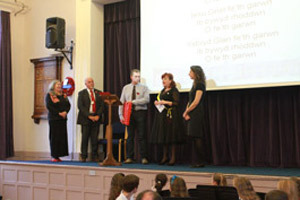 This has been a very rewarding experience for me as webmaster of the Gowertonian website. 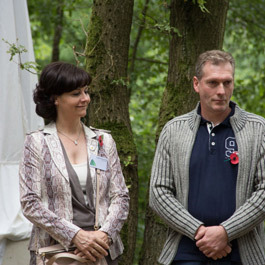 After a whole year of corresponding with Jean-Pierre Wuyts, it was indeed a privilege and honour to be invited to such a memorable event. 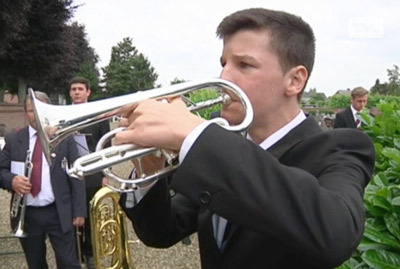 What a marvellous tribute for a young man who gave his life for others. 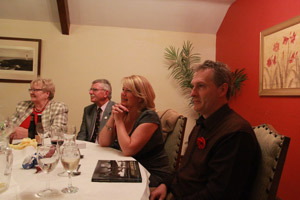 Please pass on my highest regards and thanks to M. J-P Wuyts for initiating this event. 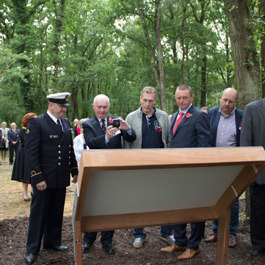 It is amazing, that 70 years after his death the people of Asch, Belgium care enough to erect a commemorative plaque to honour Penry's heroism. 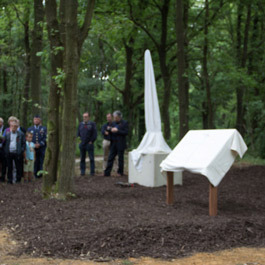 It’s a dream come true not only concerning the monument but meeting you all. 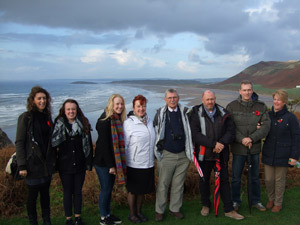 We were all astonished how proud “WELSH” people are ! 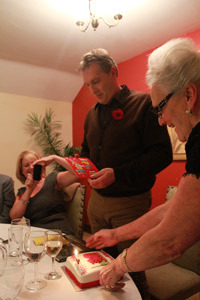 The response and gratitude felt so warm, unbelievable. 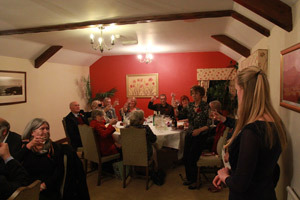 “Your all friends for life”! 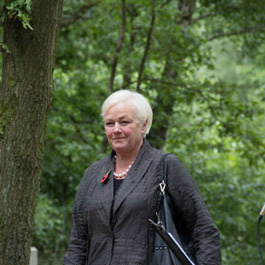 I especially want to thank “U” Val for all the work and effort you’ve done. 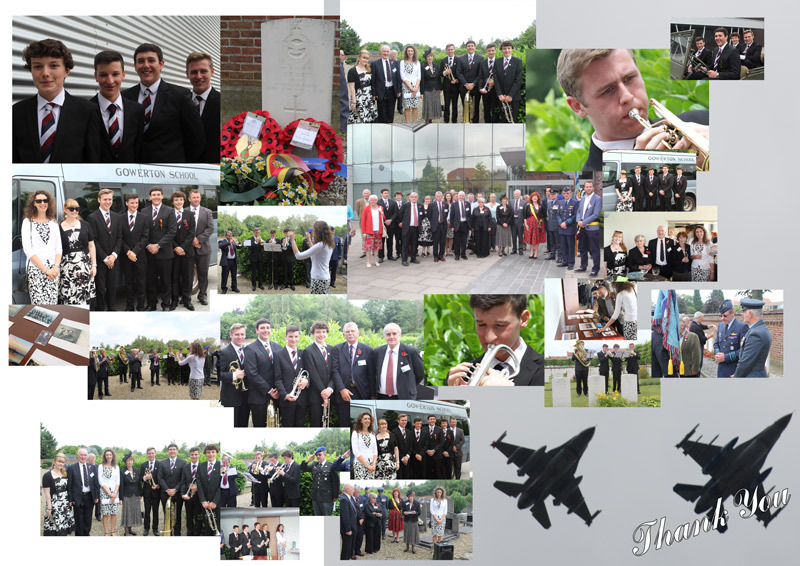 It’s an experience that will stay with me for the rest of my life . 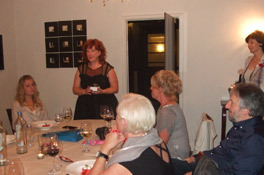 Thank “U” very much Val ! 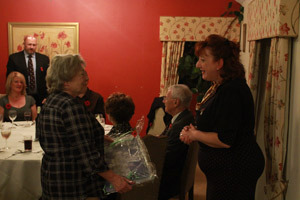 Many thanks to the Community of As. 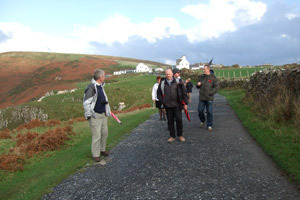 We look forward to your visit to Gowerton School and Penclawdd in November 2014 and to establishing cultural links with your community. 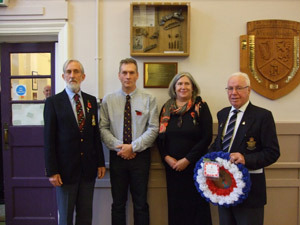 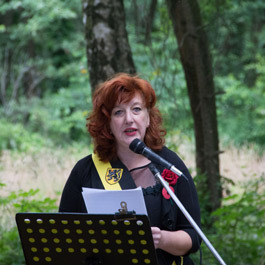 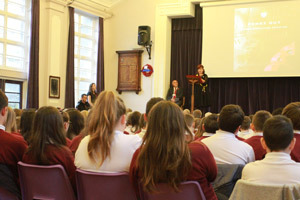 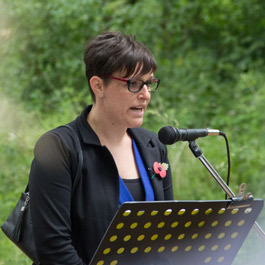 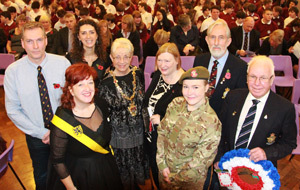 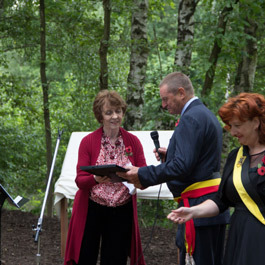 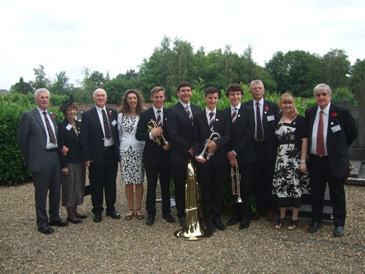 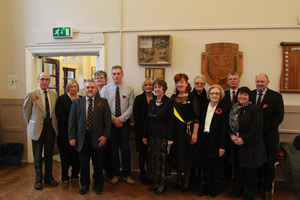 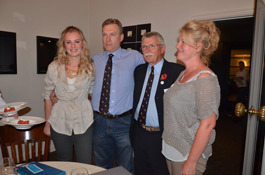 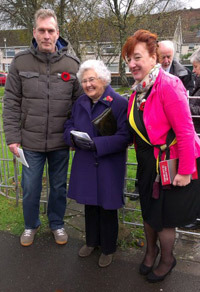 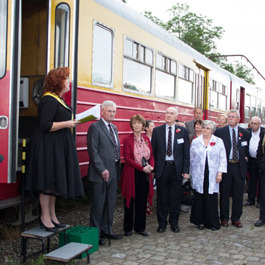 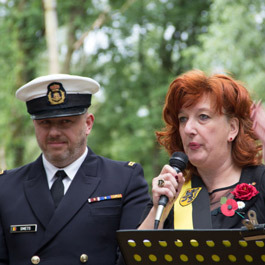 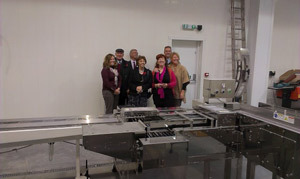 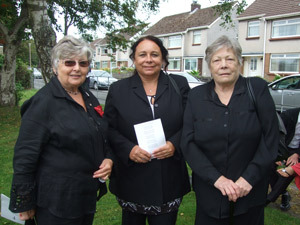 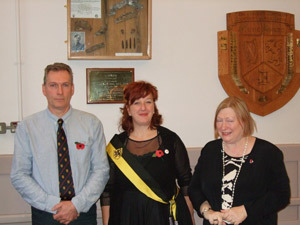 In November 2014, Mrs Kathleen De Cleene, Minister of Culture for the town of As (formerly known as Asch) Belgium, with her husband Rudi Smets, their daughters Amber and Helena, Mr Jean-Pierre Wuyts and his wife Connie were guests of Gowerton Comprehensive School at the Annual Remembrance Service, followed by the unveiling of a plaque in memory of Gowertonian, Pilot Penry Guy. 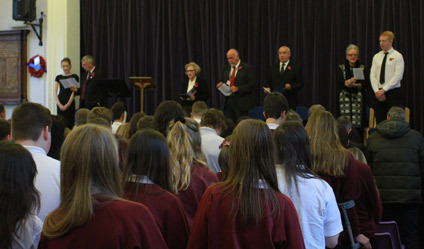 Mr Peter Harrison, headteacher, assisted by Mr Tom MacCarthy, deputy head teacher, welcomed the guests to the school's Annual Remembrance Service. 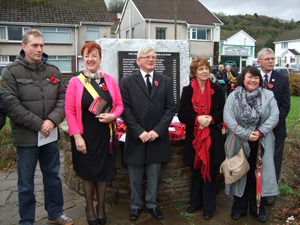 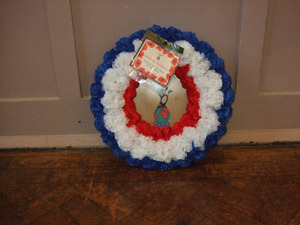 Miss Elaine Howell, vice-chair of the Gowertonian Society, read the story of 'The Unknown Soldier'. 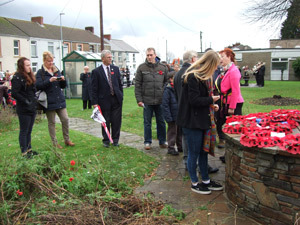 Chairman Dr Alun Jones and committee member Mrs Marjorie Stubbings laid the wreaths with head prefects, Annabelle Boardman and Marcus Besley. 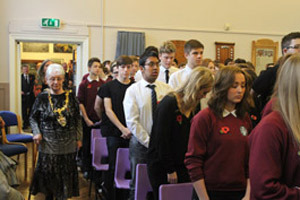 Year 8 pupils attended the service. 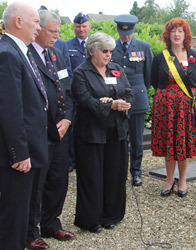 Mrs Marjorie Stubbings, Marcus Besley. 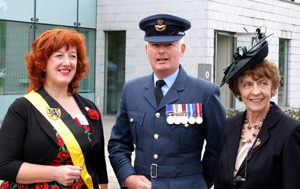 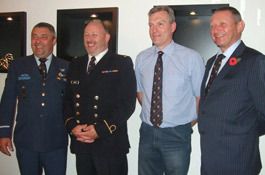 Representatives of the RAF Association and the Gowertonian Society. 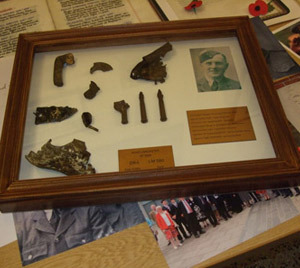 Mr J-P Wuyts had recently discovered pieces of Pilot Penry Guy's Lancaster Bomber in As, Belgium. 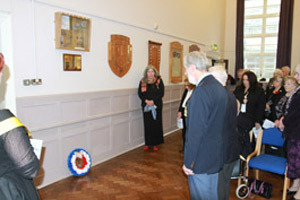 Using parts of the aircraft, Mr Trevor Cheeseman, a former teacher at Gowerton School, designed and made a plaque which was unveiled by chair of the school governors, Mrs Debbie Lloyd and Mr Jean-Pierre Wuyts at the ceremony following the Annual Remembrance Service. 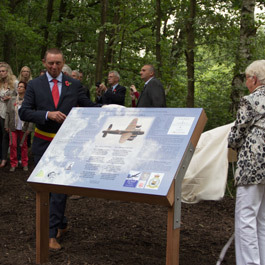 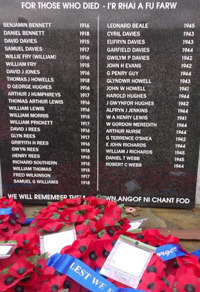 The plaque unveiled at the ceremony was designed and made by Mr Trevor Cheeseman, a former teacher at Gowerton Comprehensive School. 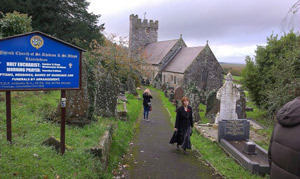 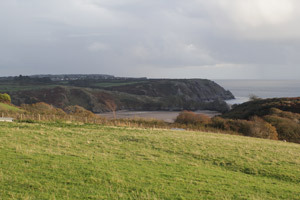 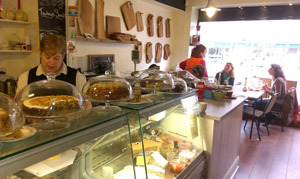 local industry, churches, beaches and the countryside. 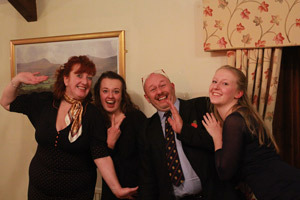 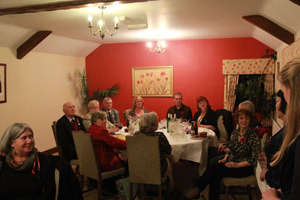 The Gowertonian Society welcomed our Belgian visitors Kathleen De Cleene, her husband Rudi and daughters Amber and Helena, Jean-Pierre Wuyts with his wife Connie to a dinner at the Gower Golf Club on 7th November, Jean-Pierre's birthday. 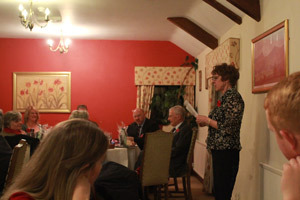 During the evening, gifts were exchanged and Val Richards read a rhyme which told the story of the Visit to Asch in June 2014 to pay tribute to Gowertonian, Pilot Penry Guy. 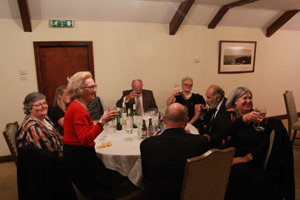 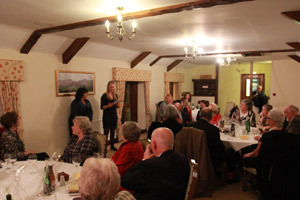 Many thanks to Mrs Marjorie Stubbings for organising the dinner, to all Gowertonian Society committee members for the wonderful welcome given to our guests, to Mrs Debbie Lloyd for the gifts for our visitors, to Miss Kath Lawlor and Mrs Olivia Martin for their support, and to Mr Dave Morgan for taking the photographs and driving the minibus. 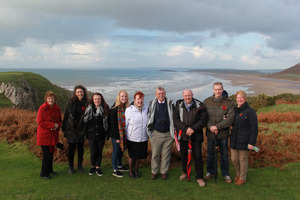 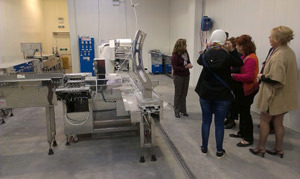 As a result of the visit, it is hoped that cultural links will be formed between our two communities, starting with a visit by students from As, Belgium to the Gowerton School Brangwyn Hall concert in March 2015. 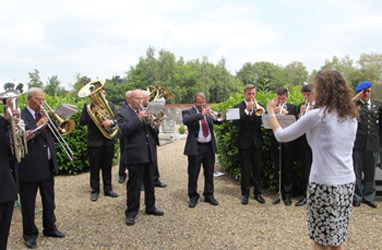 "The way that everybody welcomed us all and the graditude we received was overwhelming"
"It’s an experience that I won’t forget for the rest of my life!" 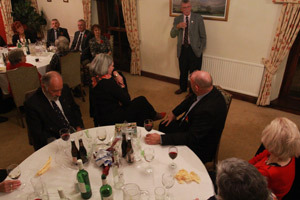 "I want to thank you all for that wonderful evening at the golf club and for the presents I received for my birthday"
"Thank u very much Val. 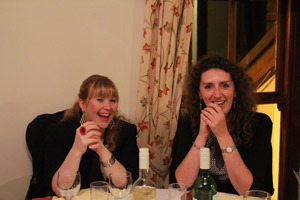 You made many people happy with your rhyme". 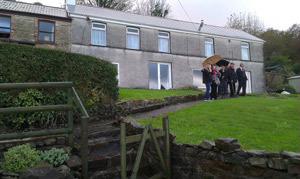 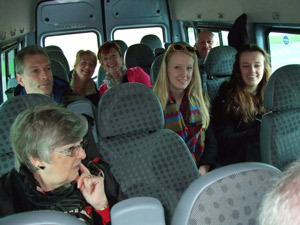 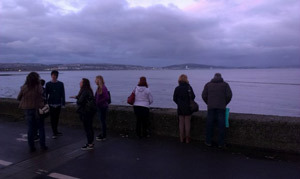 "The tour on Sunday with the Gowerton bus was unbelievable". 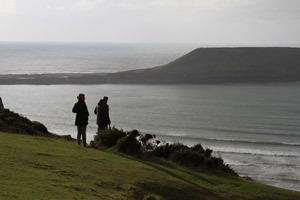 "Wales is a beautiful country". 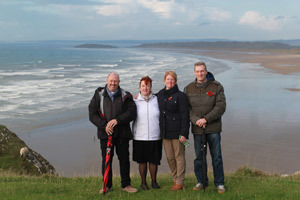 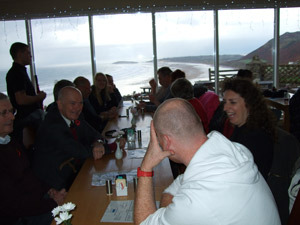 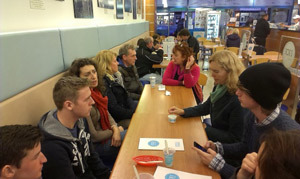 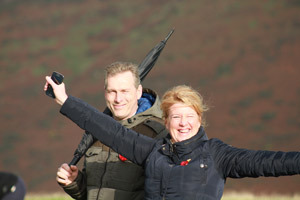 "Our stay in WALES was fantastic and for me personally it was to short"
"Thank “U” from all of us here in ASCH!"